Roland continues his quest for the Dark Tower, but he is no longer alone. He has trained Eddie and Susannah—who entered Mid-World from their separate whens in New York City in The Drawing of the Three—in the old ways of the gunslingers. But their ka-tet is not yet complete. Another must be drawn from New York into Mid-World, someone who has been there before, a boy who has died not once but twice, and yet still lives. 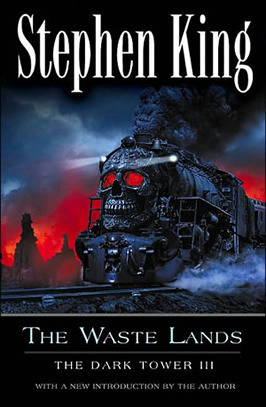 The “Ka-tet,” four who are bound together by fate, must travel far in this novel encountering not only the poisonous waste lands and the ravaged city of Lud that lies beyond, but also the rage of a train that might be their only means of escape. The stunning Plume edition features full-color illustrations by Ned Dameron and is a collector’s item for years to come. This was The Dark Tower I’ve been waiting for: that bleak and depressing atmosphere and setting from the story in Roland’s world from Gunslinger, and those mind-tripping, imaginative features – like the doors – and blending of multiples genres from The Drawing of the Three. And as there is in both books: more and more questions! A few months have passed on since Roland last came through his third and final door. He has finally recovered from his near death illness (although there is something else new that now ails him) thanks to the medicine from Eddie and Susannah’s world. Now he, Eddie, and Susannah are able to begin their path to find the Dark Tower again. However, before they are able to begin their quest, they hear a deep, monstrous roar from within woods. This creature is gain bear, who happens to be a gatekeeper for the Dark Tower. That’s how the book starts, but what got me excited was the other ailment of which Roland is trying to hide from the rest is his group: he is going insane. His mind is literally splitting in two! Remember how at the end of The Drawing of the Three Roland saved Jack from being pushed by Mort? Well because of this, Roland now as two memories: One where he met Jack in the desert, and another – caused from Mort not pushing – where Roland doesn’t even know Jack exists! Think that’s difficult, imagine being Jack. Who even though he is alive now, also has a memory where is dead. The first part – Book 1, as it called – is focused on this plot alternating between Roland’s and Jack’s world as they are both slowly going insane. Book 1 is great horror/mystery/supernatural/thriller all put in one. I don’t think I can say any particulars without getting spoilers, but Eddie plays a very big role in this first half, and his character is developed more. Jack however, is main focus on this part 1 and his character is developed the most. There is a lot of that foreshadowing/mysterious prophecy stuff going on in both timelines. This whole Book 1 is fantastic. Book 2; this is what I had been wanting. We are this town called Lud, which is a town in Roland’s world. Yes! Finally! We are exploring more of the gunslinger world! More of that dark, bleak, depressing, post-apoclyptic word. And I loved every page of it. Speaking of post-apoclypitc. My theory of what had happened to Roland’s world, to cause it to be the way it is, was wrong. Like way off, in another world (no pun intended) wrong. I figured it out right before the book was going to tell me I was wrong. Now though, I don’t even how things work there. It was exciting seeing more and learning more of Roland’s world – like ka, ka-tet, and khef – and even a little bit of Roland’s personal history, but alas, for every answer and piece of information we get, we got two more new questions about what the heck is going on and how is that even possible. I LOVE how King is able to write his characters. Eddie is great and I am 100% rooting for him. I know that he is try to change his life around from the heroin addiction, and I can tell that he is good guy. Sometimes he will get nervous or scared, and he copes with that making these stupid jokes – I love that about him. I feel like he is really starting to look up to Roland, but that scares me. Eddie and Susannah make a great couple. I don’t think she has had as much time in the lime light as Eddie, but I think she is going to be on the center stage soon. She too, I can feel is really starting to look up to Roland, and that scare me. Then little Jake. Ah, just wait till you read about him in this story. Even though Roland pushed him down the hole, when we first meet Jake in his world, he is looking for and misses Roland; he loves the gunslinger like a father, and that scares me. The first gunslinger we meet in The Gunslinger is dark dude. He has a mysterious history, no friends, and all he cares about is reaching the tower. However, all of the last book and for the first half of this one, he has been sick. And those sicknesses have made him uncharacteristically weak, and in need of other’s help… and don’t believe that is how Roland truly is. I don’t know what the real Roland is like, but I am both very excited and very nervous to find out. I have forgotten so many details but you brought them all back to life for me. I need to reread this series!!! That so awesome to hear my review did that! 🙂 And I still haven’t read past book 4 yet! Dang TBR got me sidetracked for like 4 months now. But posting these reviews is really getting my in the mood to finish these! I’m believe I should be abel to pick this back up next month! This volume was probably my favorite of the whole series, followed by book one then book four. Sad, the whole thing goes downhill after such an amazing beginning, but maybe that won’t be the case for me. Good luck with the remainder! Through the first 4 books, this one was my favorite too! Like I’ve been saying, I only read first 4 so far – the first 3 each got much better, but I thought it went down with book 4. I’m posting the review next week, but in short: King started doing a bit too much of his ramble writing. I still haven’t read this series – I keep trying to gear myself up to picking it up. One of these days I’ll succeed but at the moment it just feels like such a huge undertaking! I know; 8 books is so daunting! I can generally always read all the books in a trilogy back-to-back-to-back, but when you start getting into 4+, I always have to a take a book or two off, and then that TBR kicks in and I end up getting distracted. Daunting? Aren’t you reading or have read The Wheel of Time series? 😛 But the fact that it is 8 books was the main reason why it took me so long to finally start it. This was the book that sealed the series for me. It’s over a decade since I read it and so many scenes are still vivid in my mind. Funny enough, I just read Mike Harrison’s Viriconium, which was inspired by TS Eliot’s poem “The Wasteland,” and I think King drew inspiration for this series from both places. He’s an entirely different kind of writer from Harrison and Eliot, but I saw a lot of things that King borrowed. I’ve only read the first 4 book, but this one is by far my favorite of the series thus far. It’s everything I wanted the series to be.